A very calm and loving breed is the Basset Hound, that is also quite affectionate and makes a great watchdog. They are extremely friendly with other animals, dogs and little ones. This breed is considered very gentle with kids of all ages, but they do need to utilize caution when playing with the Basset Hound to not inflict any pain or pressure on their spines as it can harm them. They easily reside indoors and will adore having a space to roam and play outside if available. While they do not have a large amount of energy compared to some other breeds, they will require some form of exercise during the day to maintain a healthy physique. They enjoy sniffing and walking through a trail as well as spending time searching through any area. They can easily follow a trail or course without becoming distracted at all. This canine can be strong willed and not follow every order with a sense of quickness. Overall, they are rather simple to train as pups and they do bode a noisy bay when something catches their eye. For the most part, the Basset Hound is an easy breed to care for. They only need a daily walk for exercise and can even be satisfied by a small amount of time playing outdoors as well. They are at their most content when they can reside in a cozy home environment that also has an outdoor area for free play time. Their fur coats do not require very much attention just a basic grooming during the week will suffice. The Basset Hound does bode wrinkles around the face, primarily around the mouth areas that will need cared for to keep them clean and free of debris. Some, but not all have the tendency to drool at times. Some health ailments that a Basset Hound can endure can be in the form of OCD, gastric torsion, glaucoma, vWD, CHD, elbow Dysplasia, entropion, and otitis externa. A minor health issue is patellar luxation. The vet may recommend screening for their eyesight, hips, vWD and platelets as time progresses for the animal. 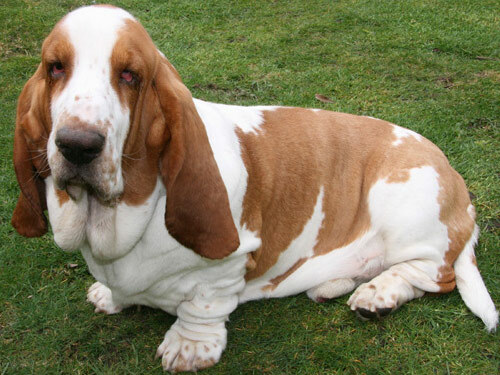 Due to the frame of the Basset Hound, they do have a tendency to gain weight easily, making obesity an issue for some. The average lifespan for this canine is between eight and twelve years long. They generally weigh from forty to sixty pounds as full grown dogs. Around the time of the sixteenth century, the Basset Hound was first discovered in France. Experts believe they were discovered in the fifteenth century though and they received their name from the French word "Bas" which is defined as a low thing or dwarf. The Basset Hounds are notorious for being a shorter canine with very short legs that carry themselves quite low to the ground. They were commonly utilized as trail hunters, with rabbits and small game being their specialty. Around the eighteenth century, they became popular in England as well as in the United States. They soon became a famous breed in the nineteenth century for their generally droopy appearance.